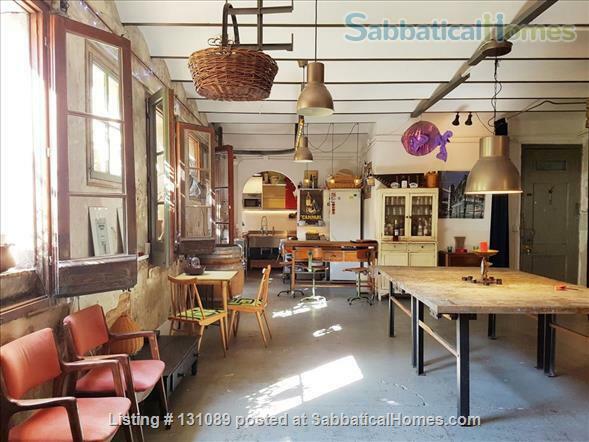 Spacious loft-style apartment with beautiful private terrace, in a renovated 200 years old building just off the Ramblas in Barcelona’s historic centre. The modern architect-designed interior was completely remodelled in 2005 with an open plan design using sliding panels and curtains to separate spaces, whilst respecting original features such as the timber beams and windows. I have put much love and care into this apartment which has been my main home for 12 years, for the moment I am living in another place nearby so I am happy to rent it for monthly terms to quiet and responsible tenants. TERRACE: 15m2 with timber deck floor, large table and chairs, outdoor cooking facilities - sink and gas cooker. Shelter from sun or rain with a remote controlled awning. KITCHEN: fully equipped with electric cooker (induction) and oven, microwave, dishwasher, stainless steel refrigerator and a bar with 4 barstools. LIVING AREA with comfy sofa, two lounge chairs, coffee table, TV, speakers with sound jack. DINING AREA with table and chairs for 6 people. BATH: large bathtub which can be opened to the living area if desired, and the “inner” bathroom (with normal door) has a shower, toilet and bidet. DRESSING ROOM: Walk-through to bedroom 1, separated by curtains, you will have plenty of space for clothes. BEDROOM 2 / STUDY: With desk area and double bed (200 x 140 cm). Can be opened up to the main bedroom or closed by transluscent sliding panels plus thick curtains. Has a window to the street with views to the Ramblas. Born and raised in Australia I moved to London in 1990 and then made Barcelona my home in 1997. I have a University degree in Architecture and most of my profession career have worked freelance as an illustrator and designer. I also organize a well known monthly supper club event for international people in Barcelona, and do some catering on the side. I love to travel although don't get away as often as I would like... when I do I always look for an apartment rather than hotel, to try to experience the life as a local. Most of my vacations have been with home exchanges and as such have spent some time in New York, Paris and Buenos Aires, some of my favorite cities, and I also love to go anyway in Italy for short escapades. I have a beautiful home in the old town of Barcelona, a loft apartment which I completely remodeled in 2005. I am currently living in another place nearby and renting out the loft for monthly stays.